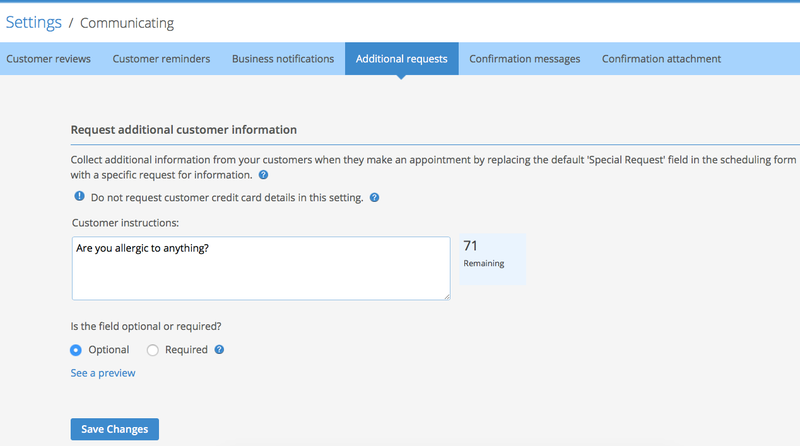 The "Additional Request" field allows you to ask your clients a custom question and provide them with a free-form box in which to answer it. Maybe you need to know if a client has any allergies or collect a bit of background information. For example, a doggie daycare or pet spa may want to know the breed, age, and weight of each pet that is scheduled. You can replace the open-ended "Special Request" field on the scheduling page with one that asks for specific information. To do this, go to your Settings (gear icon at the top right of the screen) and click on Additional requests (under the Communicating heading).